The trip starts and ends with a nice hotel stay in the city of Sorong, the tip of West Papua. After an express ferry to Misool, we kayak a couple of days from a simple guesthouse – a homestay in the outer archipelago. During the trip, we will have boat support so all equipment and food is transported by boat between the base camps. This allows us to reach more remote destinations, have more time to explore, and enjoy the feeling of being out in these tropical waters in light, unloaded kayaks. The two week trip has 3 nights camping in 2 camps and the three week trip has 8 nights camping in 4 camps. All the best highlights of Misool will be visited during the two week trip. The three week trip allows more time to explore by kayak and includes a few more destinations. At the end of the trip, we spend several days at a homestay in the inner karst archipelago. From there we will explore and also make several boat-supported kayak trips. The last camping will be in a jungle camp reached by river kayaking. The last day of kayaking will be in huge caves in a fjord landscape, possibly the highlight of the trip. The trips are for comfortable exploring, this is not a kayaking boot camp. We go ashore to discover more plus snorkel a lot, even more with the three week trip. It is mostly short kayaking distances in calm areas. If we are met with bad weather, we have reliable boat support. Sometimes we divide the group based on skills or wishes. Every participant has a radio attached to their life jacket, and much of the guiding will be done by radio so that everyone are able to hear important safety information as well as tidbits about the areas we explore. It is not necessary to participate in all of the day trips- you will also have the opportunity to stay at the camp/homestay, or to travel by boat and relax. In each trip there is space for 10 participants who will be led by 2 local kayak guides and one western guide. We offer the best kayak and camping equipment plus delicious freeze-dried food during the trip. All participants need to have some experience in kayaking and camping. We will paddle the empty kayaks up to 10-15 km per day with the two week trip and up to 15-20 km per day with the three week trip. day 1 Arrival Sorong, sightseeing, trip briefing, dinner and hotel. day 2 Transport to Misool Island and Panun homestay. 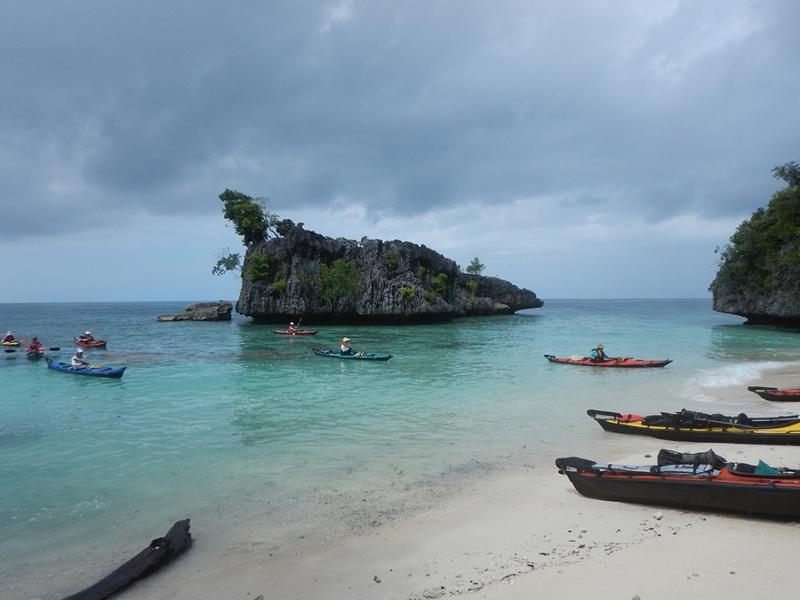 day 4-6 Kayak trip* from Panun to the inner archipelago along an island chain of incredible karst with lagoons, coral reefs, caves, jellyfish lake etc. 2 nights camping in 1 base camp. day 9 Trip* to a village, a huge cave and hiking/kayaking at ”Papustralia” islands with chance for dugongs. day 10 Kayaking* up in ”Blue river” and camping in the jungle. day 11 Trip* to a village, jellyfish lake, huge caves who we kayak etc. day 12 Transport to Sorong, sightseeing, dinner and hotel. day 13 Some sightseeing and wrap up to lunch. Note that the itinerary is preliminary and may vary due to weather conditions. day 3 Kayaking around the closest islands. 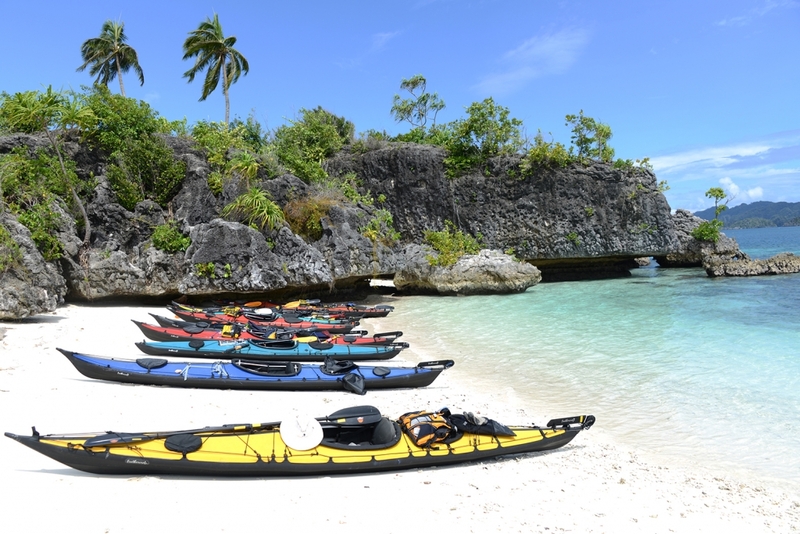 day 5-12 Kayak trip* from Panun to the inner archipelago along an island chain of incredible karst with lagoons, coral reefs, caves, jellyfish lake etc. 7 nights camping in 3 base camps. day 15 Trip* to a village, a huge cave and kayak through a long jungle passage. day 16 Trip* to ”Papustralia” island for hiking and kayaking with chance for dugongs. day 17 Kayaking* up in ”Blue river” and camping in the jungle. day 18 Trip* to a village, jellyfish lake, huge caves where we can kayak etc. day 19 Transport to Sorong, sightseeing, dinner and hotel. day 20 Some sightseeing and wrap up to lunch.